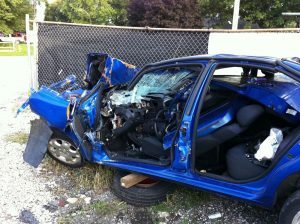 Note: Many of you reading may already know the story of my 2012 car accident. For those unaware of it, this car accident has completely altered how I live my life. I will never be the same person as I was prior to it. For now, I live for the moment. For this, I am ever so grateful (not for the experience, of course, but for its outcome). was pulled from my car by the Jaws of Life. This was a day that started simply just like any other day, with nothing out of the ordinary. I went for my morning walk in the park across the street from my apartment building; I did my three laps around the gravel track while listening to the music coming from my earbuds. I arrived to work by nine, driving half an hour from my home to a small, rural town. I was the sole reporter, but the job had its perks. I didn’t have to fight anyone for stories. I didn’t have to prove my worth. The hours were the best. I could come and go as I pleased, as long as the stories came in on time and I helped put together the paper. Then came September 10, 2012. It was a Monday and the beginning of my work week. Nothing special was going on the day. I hadn’t had stories to turn in; all I had was meetings at night—a city council meeting and a school board meeting. I spent the day preparing for them. I was relaxed and eager to write the stories. I met with terrific people who worked in the community. But, at five o’clock in the afternoon, when I kissed my fiancé goodbye, I hadn’t known that my life was going to be thrown off its axis in a matter of hours. sources. My recorder held information from both meetings, which I would use when I went home to compose the stories. I called my fiancé from school, telling him that I loved him. When he asked if my seatbelt was on, I assured him it was but I don’t remember putting it on. In fact, I never drove without it. Little to my knowledge, less than an hour later, emergency room professionals wouldn’t question if it had been there. It would be firmly imprinted on my chest. I started out on the road. It was around 8:50 p.m. and the night was clear. I eagerly watched for deer on the two-lane country road but saw none. The road was empty, except for the few cars beside me. My cell phone was in the passenger seat—a black phone in a black case. At the time, it was an Android phone. It was slow, but it got the job done. I planned on getting a new phone later on. When I hung up the call with my fiancé, my phone landed on the seat. Talking and driving is just not my thing; I prefer not to be distracted. Let me back up a little, giving a more in-depth back-history of medical issues that have caused headaches and insomnia over my driving. I’ve had seizures ever since before I was able to walk. I have a mixture of them, actually, ranging from absence seizures—where my brain checks out—to what I call grand finale seizures. The medical term is Grand Mal seizure, which is characterized by losing muscle control and dropping to the floor like a rag doll. With any good sense, I should not have gotten my license at all. Looking back, I have a long laundry list of car accidents that can be directly or indirectly traced back to seizures. While I probably shouldn’t have been driving, it gave me a sense of independence. I was free to come and go just like anyone else. Just before nine o’clock, the call came into my fiancé from a bystander at the accident. He didn’t know at the time that our lives had been steered off course, but over time, it would put us on a journey in which our bond has become much tighter. I now believe in miracles. my wedding day and imagined my husband standing at the end of the aisle — looking at my beautiful dress. But as I drove home that night, my mind was clear and focused on the road. I had no worries. I was not stressed but happy. I couldn’t wait to see the man I believe to be my soul mate. However, something happened as I approached the stoplight. At some point, my focus disappeared. I slowly maneuvered my turn with my left signal on, going between 10-15 mph. BAM! My light went dark. My car was rapidly spinning in circles like I was an uncontrolled ride of the tilt-a-whirl. My hands clasped the wheel. I stopped breathing and my body froze. I heard glass break but I don’t remember seeing it. It all happened in slow motion. All I could think about was how much I loved my fiancé and how badly I wanted to see him again. I never saw the car coming. Till this day I am still questioning if the driver in the other car was distracted by their cell phone or didn’t have their lights on. I even question myself and my seizures. Can I really trust my mind to be healthy enough that I wouldn’t have a seizure behind the wheel? A part of me isn’t sure. I have been doing so well on my medicine. My last seizure was in 2009, due to cold medicine and strep throat. Yet, nobody is able to prove I had a seizure while driving. This only leaves me questioning myself and my capabilities. If I had seen the car, I would have stayed in my lane and not completed my turn. Suddenly, the passenger-side door opens. It’s a bystander, alerting me that the paramedics are on their way. “Please call Stan,” I tell them, informing him that he was the last person in which I had spoken. I immediately apologize, telling them they were looking for a black phone on what was a dark road. There didn’t appear to be many lights around, but it was hard for me to grasp the full scene. I couldn’t imagine what was going through Stan’s mind as he got the call. I couldn’t imagine how frightened he was or what his first reaction may have been. At that point, I just wanted to be with him and out of that wreckage. A paramedic stood beside me while one sat in the backseat behind me. They instructed me to stay calm as the rescuers worked diligently to free me. Draping a sheet over me, the only way to get me out was to take off the roof. I was lucky that I didn’t run into any other cars, a telephone pole or have my car set on fire. I was undoubtedly blessed by a loving God who was with me in the car, pouring his love onto me and helping me to stay calm. scream in response to it. Both of my arms suffered broken bones. My right arm took the brunt more than my left arm. Long months of therapy were ahead after I healed but I had to keep my mind calm. They put me on a stretcher and carried me to the ambulance. Unlike other nights, I couldn’t even enjoy the night sky. By the grace of God, I was lucky that my torso, neck, and head were unharmed. Had I not had my seatbelt on, I might have been thrown from the car and I might not be in Heaven. It wasn’t my time and God gave me a second chance. I wasn’t surprised that Stan beat the ambulance to the hospital. I’m happy that he was there when I arrived. He is my rock and my strength. I remember apologizing to him over and over while he just stood beside me, telling me that I would be all right. My body was in shock as a result of the accident. The emergency room nurses had to start an IV and I fought them because of my fear of needles. My anxiety was at its peak, my peace of mind was lost and all I wanted was to get better. I had thrown calmness out the window. The nurses finally got the needles in and convinced me to relax. But, who can relax after experiencing something as traumatic as that? The x-rays were most memorable. While the technicians were kind and patient, I couldn’t let out anything less than a painful scream when they moved me. It turned out that I had fractures in my left hand, my right wrist and elbow and my right ankle. I finally was admitted to a room after a long night of treatment. My family came down the following day. I believe that was the day I tried to persuade Stan to take me home. myself. This was the hardest part of my ordeal. I didn’t realize until later on that God was testing my faith. I believe there is a reason for everything, and, while God is awesome and mysterious, deep down he wanted me to learn something from this experience. The experience made me more trusting God and made me realize I can’t do everything on my own. I learned to lean on him more and not to doubt his love for me. 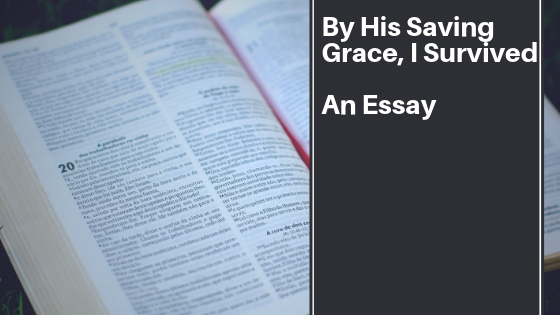 It was through this experience that God spoke to me, telling me not to waste this second chance. This is why I live each day as if it were my last. We are not promised tomorrow. I tried to keep a cheerful, upbeat attitude throughout the first few days at the hospital. At some point, I asked Stan if I could go home and he said I could not. I don’t think I realized how badly I had been injured. The nursing staff was friendly and upbeat. Their attitudes really kept my spirits high. However, I didn’t like the fact that I was becoming a TV junkie. I don’t enjoy watching television, but that was all I could do. I felt very lazy and unproductive. The doctors said I couldn’t stay in the hospital and I couldn’t go home. They suggested I needed around-the-clock care which was something a nursing home could provide. 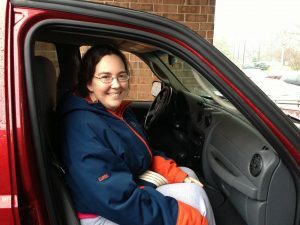 I had just celebrated my 32nd birthday I would be going to a nursing home. Pureed food and bingo were in my future, but, once again, my family and friends proved to be my sources of strength. They came to visit me and they kept my spirits high. Stan, the good man I married as planned, brought me food daily to save me from eating too much peanut butter and jelly or cereal. He even fed me like a baby bird (which, I admit, I probably had too much fun at)! My real battle had just begun. I was sinking into depression and crying every day. I was having nightmares of the car accident and I was becoming irritable with those that visited me. I was never diagnosed with PTSD, but it is possible to get it from traumatic car accidents. But, one thing I never questioned was my faith in God. I knew He would heal me inside and out. That fateful night changed my life but it would also define its purpose. It was hard to trust God but had to lean on Him more than ever. For several weeks of being in the home, I never left my room. I had to heal my bones. Therapists brought me toys and stress balls to help me loosen my stiff fingers. They gave me Play-dough, which one of the nurses made specifically for me. I was still a TV junkie, staying up late while the therapists woke me up early. Then Stan brought me a Kindle. He even set it up so I could watch movies and FaceTime him on the iPad, which we had got shortly after our wedding. The wedding happened around three weeks after my car accident. My sister came to wake me up on the day of our wedding. She, my aunt and my nieces decorated my wheelchair in hopes to boost my spirits in light of the day. In a way, it worked as a quick fix. 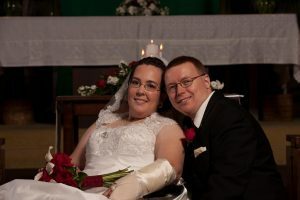 Yet, for months after the recovery, I wasn’t able to shake the feeling that I was cheated out of walking down the aisle. I had looked forward to it and it’s a moment I’ll never get back. The funniest moment of our wedding was arriving in a nursing home van. I guess that’s something you can’t plan but it’s certainly unique! I can at least, say that I’m proud of myself. I made it through the entire day—all the way to the wedding reception—without any pain medication. It was my goal to do this and I made one milestone if that. At that point, my hand had loosened enough that I could use the therapeutic silverware. The staff at the nursing home were excited for me and Stan. They had never had a patient who was getting married and they made us the center of attention, giving us a private room just for the night. We came back to the room and saw that they had decorated it for us. That was really uplifting. I was with the man who makes me laugh every day. Towards December, just days before Stan’s birthday, I would leave the nursing home and return to the hospital for a second surgery. This surgery would correct the fracture in my elbow. It would be January before I was home sleeping in my own bed again. The holidays in the hospital were the toughest to overcome. While my family came for the holidays, it was tough watching them leave. 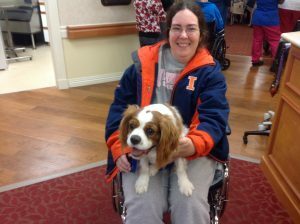 I would be in the rehabilitation at the hospital for a few weeks until I was admitted to outpatient therapy. Now the real fun began. I had to step up and do all the exercises. It was really hard, but I had to motivate myself. I had a strong support system around me. They were my cheerleaders in the months to come. When I had therapy, Stan and others were right there watching me. He saw me learn to walk again and stood there, proud. As tough as it was, I managed to go through therapy with him, my family and friends by my side. Somehow I wasn’t doing this for myself but more for them. This was at the nursing home, right before I left for my second surgery. A few weeks after my second surgery, I looked forward to seeing Stan daily. I was now home and I was over the moon. He would come home to fix me lunch and to check that I was doing all right. It was nice having his company, as I wasn’t mobile and couldn’t get around well. As my hands became normal again, I began taking my Kindle to the hospital on days I had therapy. This meant that I could sit there and read while I waited for Stan to get off work. There was even a day when I ordered lunch in the doctor’s waiting room, to the dismay of all those waiting in there with me. Little to their knowledge, I would spend all day in the waiting area, but I enjoyed getting out and getting fresh air. It seemed like I went from a wheelchair to a walker quickly. As soon as I was able, my physical therapist put me on a treadmill and had me doing stability exercises. On Easter of 2013, I started walking with a cane, and, shortly after that, I journeyed without any walking assistance at all. For a few weeks, this worried Stan because I fell quite frequently. But every time I fell, I rose up and fought harder. My biggest regret was never meeting my rescuers. I wanted to look into their eyes and thank them for pulling me out of the wreckage. Without them there, I might not have survived. First responders deserve a lot of credit. They work tirelessly to save lives, knowing that they may never see the people they saved. But, to my rescuers, I extend my deepest gratitude. When I needed you, you were there. My faith in God has strengthened since the accident. I lean on Him now more than ever. Through him I know I can do anything. I realized how truly fortunate I am, and I know I am blessed to have such a strong support system. Tell your loved ones how much you love them each day. Live each day as if it’s your last and get down on your knees to pray. Life is too precious to throw away.